The FoodWIse Program provides nutrition, food budgeting, and food safety education programs to limited income families, children and seniors. FoodWIse offers educational programs in most Wisconsin counties. The Wisconsin School Breakfast blog contains information and resources about School Breakfast Programs in general as well as school breakfast program-related information specific to Wisconsin. 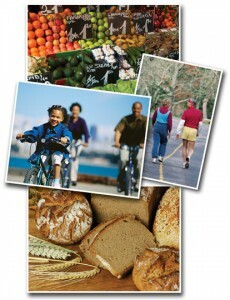 Information on food safety and nutrition to help keep your family healthy. The Safe & Healthy Food Pantries Project provides food pantries with guidance on how to improve the nutritional quality and safety of their food inventories. Wisconsin Connections is an educational series intended to assist families wanting to connect to state and federal support programs. Helping women of all ages live stronger, healthier lives by providing knowledge, inspiration, access to programs and ongoing support. The mission of the program is to provide information, insight and analysis of technical and social issues of biotechnology to people in Wisconsin. Tours and workshops are available for learners of all ages. Resources for extension educators include PowerPoint slide sets, posters, handouts and conferences. NIFA funded research, education, and extension to develop and use biotechnologies for food and agriculture. Nutrition.gov provides easy access to information on nutrition, healthy eating, physical activity, and food safety for consumers, educators and health professionals. USDA’s new Choose My Plate food guidance system provides many options to help Americans make healthy food choices and to be active every day. Home page for the USDA Center for Nutrition Policy and Promotion, the agency that publishes the Dietary Guidelines for Americans and related materials such as the Healthy Eating Index, Nutrition Insights reports, and the Thrifty Food Plan. FNS provides children and adults of all ages with nutrition education materials on how to improve their diets and their lives. Your portal to objective, research-based and credible information you can use every day to improve your life. Brought to you by experts from the nation’s largest and oldest network of universities.